On May 11th The University of Southern California held it's Commencement Ceremony for the class of 2018 at Alumni Park. The main USC Commencement celebrated the 135th anniversary of the ceremony on USC's campus and the graduation of more than 5,000 undergraduates and 10,000 graduate students. Renowned physician and author Siddhartha Mukherjee served at the key note speaker for the event. Mukherjee is known for his work redefining the public discourse around human health and for his Pulitzer Prize winning book The Emperor of All Maladies: A Biography of Cancer. Following the main commencement, USC's individual schools held their own ceremonies to recognize their outstanding graduates including the USC Viterbi School of Engineering. The Viterbi School of Engineering held their Commencement on the new USC Village Great Lawn which is part of an expansion to USC's residential life that opened in August of 2017 and boasts 15 acres of an immersive learning environment. This provided the perfect backdrop as the Viterbi School awarded degrees to it's students majoring in engineering fields from Electrical and Aerospace Engineering to Green Technology and Architecture students. The Herman Ostrow School of Dentistry of USC also celebrated their commencement on the USC Village Great Lawn. The combined undergraduate and graduate ceremony welcomed key note speaker, Dr. Michael R. Cousineau, Professor of Clinical and Preventative Medicine at the Keck School of Medicine of USC. 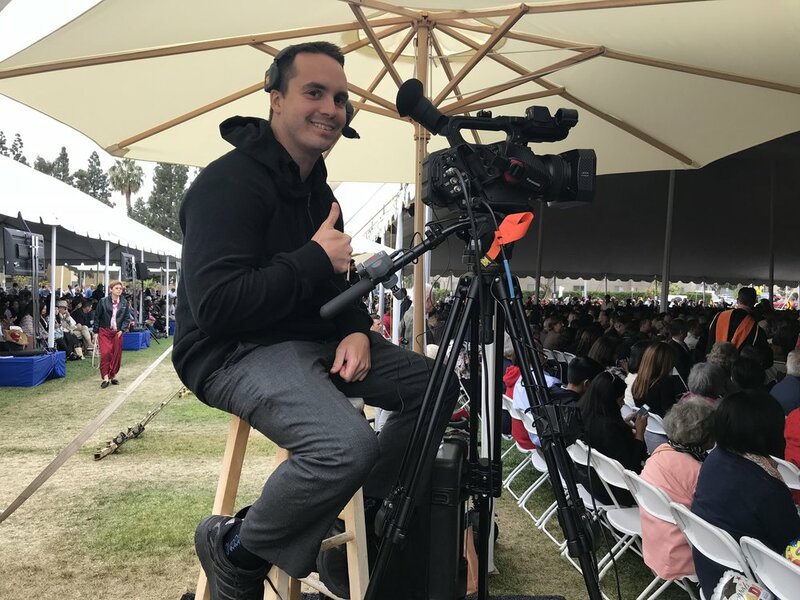 Working with Take One Digital who were responsible for capturing the many commencement events held at USC, ESI Video was on hand to enhance the ceremonies for both the School of Engineering and School of Dentistry. With a multi-camera set-up using Panasonic's DVX200 4K cameras, ESI streamed the two events across the world and provided monitors for those sitting far from the stage to see their loved ones receive their hard earned degrees. The show was live switched using the Blackmagic Design ATEM Television Studio and recorded and monitored on the Atomos Sumo 19 Monitor and Recorder. Afterwards all the commencement ceremonies were available to purchase on DVD from Take One Digital.